Recently, I nearly missed some interesting wildlife behavior that was happening right in front of me. On an overcast morning in late March 2011, I took a number of unremarkable photographs of distant subjects like Little Blue Herons, Neotropic Cormorants, Great Egrets, Least Grebes and Snowy Egrets from the edge of a pond in Santa Ana National Wildlife Refuge near Alamo, Texas. Only after having been at the spot for nearly half an hour did I notice a Diamondback Water Snake stretched out on a log right in front of me. until it came to the end of the log. Diamondback Water Snakes are nonvenomous snakes that give live birth from fertilized eggs retained in females’ bodies. Females are noticeably larger than males. Based on size, the first two snakes were females, and the third was a male. 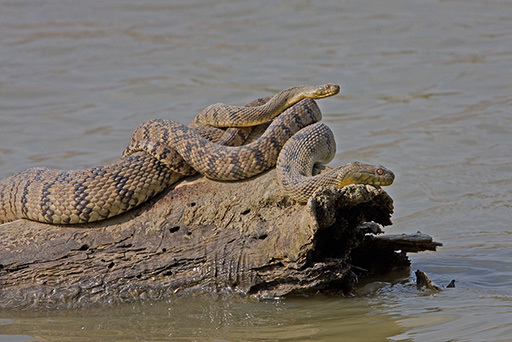 After a few minutes of indecision, the male snake slipped off into the water, turned around and crawled up the back of the female in the opposite direction. Once the male snake was stretched across the back of the female, neither snake moved appreciably for twenty minutes or more. By this time, a crowd had gathered. Some people seemed more interested in chatting with each other than observing nature. Feeling frustrated with the crowd and thinking that the best of the show was over, I left. I returned to the site after half an hour. The crowd had moved on, but the snakes were still there. A larger version of this photo is currently displayed in the snakes gallery on StockerPhotos.com.